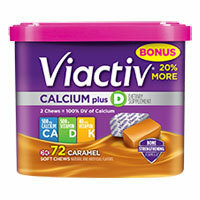 Viactiv is the number one doctor-recommended calcium supplement chew. Get 100% of the daily value of calcium you need in the flavors you love. Available in Milk Chocolate, Sugar Free Milk Chocolate and Caramel.